Your initial glance heightens the anticipation: carriages gleaming in umber and cream livery, stewards resplendent in their immaculate uniforms, while they wait for you to board the train. This is the Belmond British Pullman (sister train of the Venice Simplon-Orient-Express), the most stately of trains. It's like stepping back in time. Because, over a century ago, George Mortimer Pullman, the originator, recognised that his passengers would be accustomed to unrestrained luxury and comfort. And, in order to accommodate them, he issued orders to the finest craftsmen of the day to construct in his words "Palaces on Wheels". His instructions were honoured in every respect. 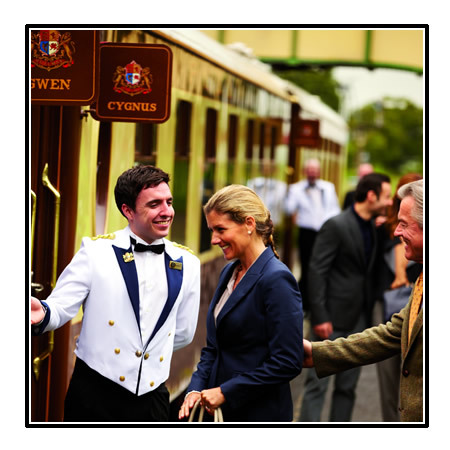 Your steward will show you to your reserved seat in one of eleven carriages, each an original masterpiece from the 1920's or 1930's with their own name and unique personality. On board passengers are seated in either ‘coupé’s (small compartments seating up to four people) or in the open car mostly at tables for two. There is a limited number of single tables and of tables for three persons in the open car. The train can carry up to 226 passengers and consists of 10 parlour cars, of which 5 are kitchen cars, and a service car. The carriages seat between 20 and 26 passengers in each. The service, like your journey, will be calm and unruffled. Settle back into your deeply comfortable seat and be transported into another age while Britain's glorious countryside unfolds past your window. 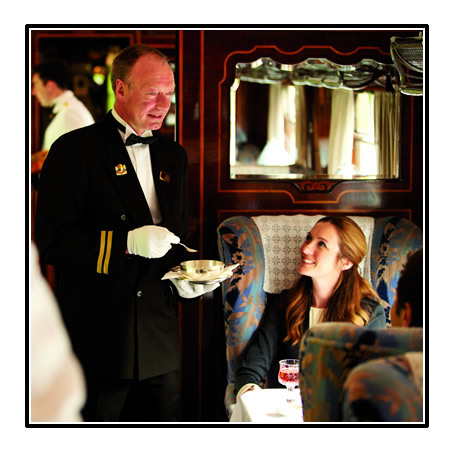 Step aboard and return to an age of luxury, comfort and glamour, when service was always impeccable and life was lived at a less hurried pace; the quintessential Venice Simplon-Orient-Express experience. Plush upholstery awaits, surrounded by intricate marquetry, mosaic floors, solid brass fittings and softly-shaded lamps. Your table is set with starched white cloths, shining silver and glittering glass. The cuisine is a delight and accompanied by wines judiciously chosen to complement the fine food. Each carriage is an original masterpiece from the 1920s or 30's, resplendent in rare timber veneers, custom-loomed fabrics and solid brass work. Comprised of original carriages from the golden age of travel, lovingly restored with breathtaking attention to detail, each car is a symphony of intricate marquetry, inlaid mosaic floors, sparkling crystal and beautiful art deco design. Each carriage has its own name, its unique personality and its own colourful history. Even its own secrets. The Belmond British Pullman matches destinations to your tastes; feed your artistic senses with music and magical works of art. Feast your eyes on an historic, horticultural, architectural and literary banquet. And, of course, pamper your taste palate with the finest food and wines. 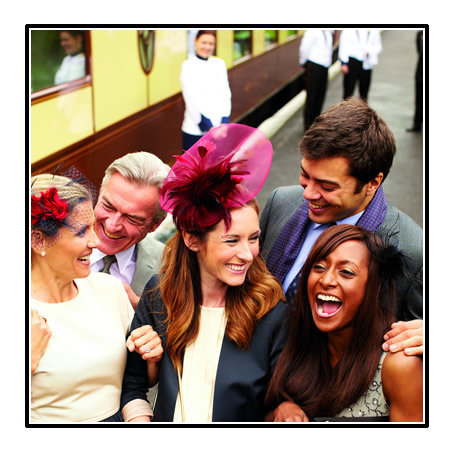 What better way to celebrate any occasion than a Pullman experience of a lifetime for you or someone special? These sparkling new excursions have been thoughtfully created to ensure you enjoy the sights and delights of both Britain and the Belmond British Pullman. In their time, they have witnessed political and financial intrigue, uproarious celebrations and scandalous liaisons. In your own time, experience this magnificent train and the very texture of history to the full.